Breast milk offers benefits for all babies, but it is especially important for premature babies who need the nutrients to boost their immune systems. 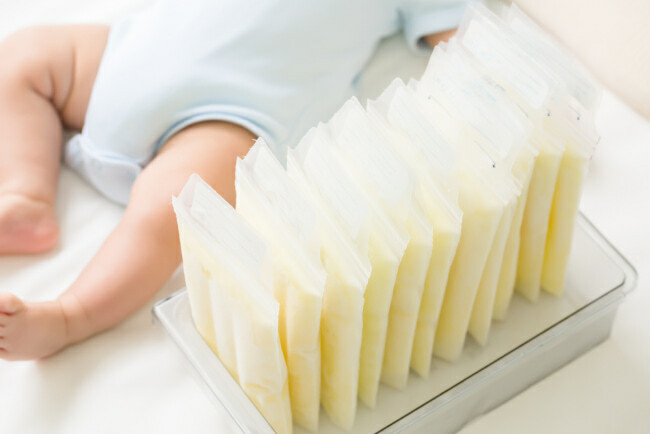 Mom’s own milk is the best option to help prevent life-threatening necrotizing enterocolitis, but donor milk is the second food of choice for those very premature babies. And it’s not just premature babies who sometimes need donor milk. New mothers are encouraged to express their own milk within the first hour after delivery, but sometimes the baby is ready for a little more milk before mom’s own milk is plentiful. Donated pasteurized milk is then the next best option for nutrition. The concept of feeding a baby with another woman’s breast milk isn’t a new one. For centuries, “wet nurses” breastfed babies whose mothers were unwilling or unable to produce milk for their babies. In some cases, these women were hired or volunteered to feed a baby whose mother had died or been incapacitated in childbirth. Today, though, breast milk donation provides a means for women to supply essential breast milk to premature babies in a safe way. And now, this option is available to women in the Chattanooga area. Read on as we explore the topic. Breast milk offers a multitude of benefits for all babies, providing the exact nutrition a baby needs at a given stage of development. Each mother’s milk is especially designed for her baby. But for premature babies, that milk offers even greater benefits. In the last three months of pregnancy, protein components called “immunoglobulins” cross the mother’s placenta to the growing fetus. These immunoglobulins play an essential role by passing along a mother’s immunity to certain infections to the baby until the baby is old enough to develop its own immunity. But when a baby is born prematurely, at least part of this essential stage of immunoglobulin growth is missed. That’s where breast milk comes into play, passing along extra immunoglobulins in each feeding. Mother’s own colostrum has 12 times the immunoglobulins than the mature milk. In addition, when a baby is born prematurely, the GI tract is underdeveloped and tiny, making it more difficult to digest food. Breast milk is more digestible to a premature baby’s stomach than formula. Other research has shown that breast milk helps lower the risk of SIDS, boosts cognitive development, and reduces the risk of developing medical conditions later in life, including allergies, asthma, obesity and Type 2 diabetes. Mothers’ Milk Bank of Tennessee, a nonprofit organization, has opened multiple drop-off locations across the state for women who have excess breast milk they wish to donate. The Depot at Children’s Hospital at Erlanger is the seventh hospital drop-off to open in the state — and the first location in east Tennessee. Once frozen milk is dropped off at a depot, it’s transported to a pasteurization facility in Texas, where it’s prepared for distribution to Tennessee babies. There are plans to eventually open a pasteurization facility in Tennessee to allow for quicker preparation and distribution. Plus, there are health benefits to babies receiving breast milk from their own geographic area. Who’s eligible for breast milk donation? Mothers whose infants have passed away can also donate breast milk in memory of their baby. To determine your eligibility, you can visit the Milk Bank website to complete a questionnaire. From there, someone will call you within five to seven business days to determine approval and begin any required testing. After you’re approved, you can begin dropping donated breast milk off at Children’s Hospital at Erlanger! Just call 423-778-8304 to schedule your drop off date and time. For more information on how you can donate breast milk at Erlanger to help our region’s premature and at-risk infants? Please visit our Breast Milk Donation information page. I think this is a wonderful thing for the baby and mothers that can produce enough for there baby. I wish it was around when my grandson was in the NICU in Chattanooga. They are a wonderful hospital for babies and there family. I really don’t know what we would of done if it wasn’t for all the wonderful nurses, volunteers, and Doctors at TC Thompson hospital. Not to count The Ronald McD house. All the wonderful staff, & volunteers at the house was amazing also. We were lucky to only be there a month and 3 days. There were some that had to stay for a lot more months. I really don’t know what we would of done if we had to stay longer. The month was hard on our family. I could go on and on about the two places on how wonderful they were. Thank you for your kind comment, Sabrina!